Wedding Mandap Decoration - 5 Unique Ways to Do It Differently! Wedding mandap decoration is one of the most important aspects of Indian wedding décor. We’re sure these kinds of questions are continuously running through your mind as you try and fix your wedding decoration ideas. It is so essential that each part of your wedding speaks of your personal taste and style yet also keeping it instagram-worthy – don’t you agree? Table settings, wedding drapes and lights, sound – so much detail to take care of. And wedding mandap decoration takes the lead in this decision making process. In order to make your vedi mandap is not only beautiful but unique too, take cues from our Real Wedding couples whose wedding mandap decoration experiments took them the right way. They took concepts of old-school mandaps and added their own twist of contemporary to it! Opt for a bold backdrop and keep the rest of wedding mandap minimal and elegant. Too many bold elements can be distracting, messy and it just might end up looking too clustered. To keep ypur wedding mandap classy yet traditional, pick one element and make it large! Larger than life chants and Om signs wrapped up in flowers or just a simple floral wall – Components like these will make your wedding mandap double up in style, elegance and class all at once! Another way to pretty-up your wedding mandap is to go for the dangling décor details. Just as big a trend as the chandelier mandaps, are these dangling details at on the roof of the mandap. Be it flowers, kaleere or just simple strings of marigold – these beauties accentuate your wedding mandap and making them look like a million bucks! Glass or crystal strings work beautifully too. The dome styled mandap has been the classic style for eons now but our real wedding couple’s Rushi and Disha, Deepika and Ankit and Tushi and Vaibhav put their own twist to the traditional dome mandap. They went with an abundance of the natural – ferns, flowers and loads of red. The vedi mandap was decorated beautifully with loads of red, fresh flowers, dangling kaleere and green ferns too. Ever too often, we forget the green and have all our focus on the flowers. Fresh leaves and ferns can be just as beautiful as those colourful flowers – so try something trendy this season with a contemporary twist to these traditional dome mandaps. 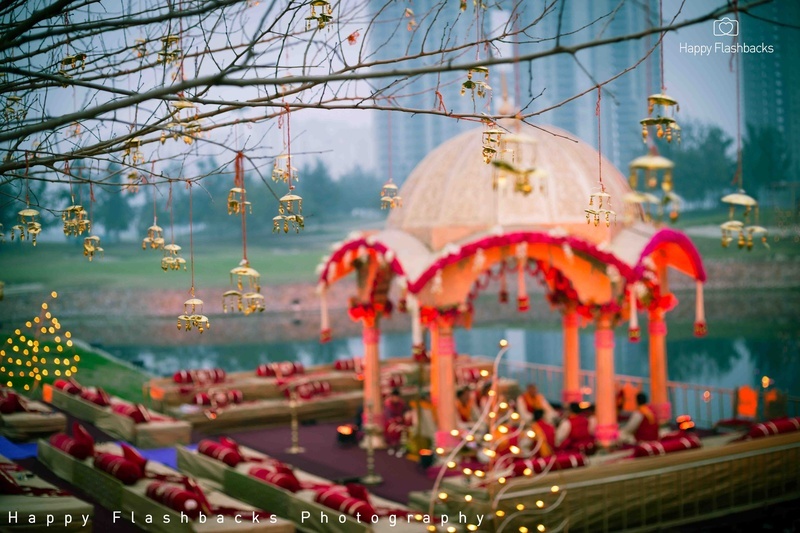 If you wanna go all-out awesome opt for an open-top mandap or a no-structure mandap. These are the kinds that spell out minimalism in every way. Real Wedding couple Miloni and Gautam did not have a mandap and took advantage of their destination beach wedding held in Phuket, Thailand. The setting sun as a backdrop was all they needed! If you don’t wanna go for an option this minimalist, opt for an open top mandap like Sameer and Aishwarya’s! Minimal clustered floral arrangement paired with pretty drapes were perfect for their beach front wedding. Their biggest feature as their pillars wrapped up in fresh flowers - how can we not love? Contemporizing the classic mandap décor with these extravagant floral structures. Pillars enfolded in flowers in beautiful designs are the new thing at Indian weddings! Real Wedding couple's Pallak and Sid as well as Aditi and Neeraj took hold of this stunning wedding mandap trend perfectly!